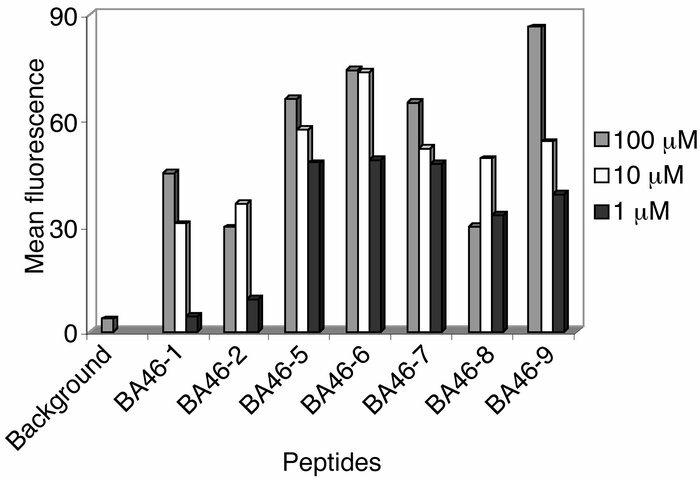 Stabilization of cell surface MHC by BA46-derived peptides. BA46-derived peptides were loaded at various concentrations (1–100 μM) on TAP2-deficient RMA-S-HHD cells as described, and indirect FACS analysis was performed by incubating 5 × 105 loaded cells with anti–HLA-A2.1 MAb BB7.2 for 30 minutes at 4ºC. After the cells were washed with PBS-0.5% BSA plus 0.1% sodium azide, the secondary Ab, goat anti-mouse-FITC, was applied for 30 minutes at 4ºC. Following another wash, the amounts of bound Ab’s were detected by a FACScan. Mean fluorescence at 1–100 μM peptide concentrations is shown. Results are representative of three similar experiments.